Planck Length | Walk the Planck! "To Planck or Not To Planck, Is That The Question?" A research project about an integrated Universe View for the National Science Fair, began in a high school geometry class in River Ridge, Louisiana. • Is There Order in the Universe? • Might this necessarily be the smallest-biggest-simplest scientific experiment? In just 202.34 to 205.11 notations (base-2 exponential), you’ve got the entire universe in your hands. It all started with simple geometries. Obviously, this is an ideal universe that is highly-ordered and fully-relational, but what a starting point for more research! And, in the middle of it all, somewhere between the 101st to 103rd notation, there surely appears to be a concrescence of meaning from both directions. • Take the first survey! Start here with the consent and disclaimer. • The next tour and survey. More in preparation – Access all right here. – Very Big and Extremely Small Numbers (Make friends). – Survey #2. Disclaimer comes first, then five simple questions. Notes about Look-Feel and Navigation: If the line just above extends out of the white background, please open your window larger (perhaps full screen). Also, within the tour, if you click on the last sentence in each description, you should go to the next page. There are over 202.34 and as many as 205.11 notations. This table focuses on the Human Scale and notations 67 to 134-138. The Small Scale (1 to 67-69) and Large Scale (134-138 to 205) will follow after updates, verifications, and the footnotes have been completed for this first table. This chart is 60″ x 12″ and it was the original depiction of the 202.34-to-205.11 notations. The question was asked on December 19, 2011, “Why isn’t this stuff on the web someplace?” It seemed like somewhere in our midst was a fundamental logic flaw. Very cautiously, this page was put up on the web over on the Small Business School website so family and friends could be asked to read this introduction and caution us or encourage us along the way. May we turn to you for insight? That big chart on the left measures 62″ x 14″ so it can be a bit awkward to use at your desk. We wanted to present the data in a more simple format (to be printed on 8.5×11 inch paper or displayed on a smartphone) so we created the chart on the right. We are calling it, the Universe Table. This is a long-term project, so we would like to ask a few questions to help us prioritize and focus on important things to do. It is going to take us a long time to figure that out, so we need to get started. We are asking our guests — “Would you please take a very quick, very simple survey, then go on the tour. On the right, you will see a green arrow. Just click on it to begin. Both charts represent the same thing — the visible universe. The very smallest measurement is the Planck Length. The largest is the Observable Universe. From the smallest to the largest, there are less than 206 notations or steps. Click on each image to see the full-sized rendering. • Just what’s happening here? Base-2 is 3.33 times more granular than base-10 and it mimics nature. There is a special magic in multiplying by 2. Since doing the base-2 chart of the Planck Length in December 2011, we’ve asked several people if they had seen the base-2 progression from the Planck Time to the Age of the Universe. Nobody had. Because we could not find such a comparison (between the progressions from the Planck Time and the Planck Length using base-2 exponential notation through the successive doublings out to their given limits, i.e. the Age of the Universe and the Observable Universe respectively), we offer this chart for your analysis now. Our next step is to do the simple math for each of the Planck Units to see what we can see. These doublings do kind-of, sort-of end up somewhat in synch. Considering the duration and the length, and the nature of very large measurements, for all intents and purposes, they are synched! Though these charts will be tweaked substantially, the best confirmation is at the notations (or doublings) that define a day in Planck Time units correspond closely to distance light travels in a day in Planck Length units. And, the doublings within the Planck Time column for the definition of a week correspond closely with the distance light travels in a week within the Planck Length column. And, finally, the doublings in the Planck Time column that define a year correspond closely with the distance light travels within a year in the Planck Length column. These are the first baby steps of analysis. How many hundreds of steps are there to go to discern all the faces of its meaning? Who knows? From here, we will continue to look to see what meaning and relation evolves at a particular notation where one column appears to impart value to the other. Just on the surface, this chart seems to suggest that there are other possible views of the nature of space and time where order (sequence), continuity, symmetries, and relations seem to play a more fundamental role. Science and our common sense worldview assume the primordial nature of space and time. As a result of our work with the Planck Units, we hold that conclusion up for further inspection. How do things appear as one begins to approach the Planck Length and Planck Time in synch? As we add more Planck Units to this chart, what else might we see? What might we learn? So, we will add mass, electric charge, and temperature to these listings. And then, we’ll add the derived Planck Units (12) and then ask, “Is there anything more we can do to establish a range from the smallest to the largest? What might a comparative analysis at each doubling reveal to us? At this point, we are attempting to learn enough to make a few somewhat intelligent guesses. This stream of consciousness continues at the very bottom of this chart. 1.20232257536 s (1s ≠ perfect tp multiple) 10? 3.23239994×10-35 m The first doubling, step, or layer. 1. We are in the process of refining this chart and will be throughout 2015 and 2016. 2. Our very first calculation with the Planck Length column (December 2011), resulted in 209 doublings! We found several errors. Then , with help of a NASA astrophysicist, Joe Kolecki (now retired), we updated our postings with his calculation of 202.34. Then, a French Observatory astrophysicist, Jean-Pierre Luminet, calculated 205.1 doublings. We are very open to all ideas and efforts! We are studying the foundations of foundations. One might call it a hypostatic science based on the simplest mathematics, simple geometries and observations about the way the universe coheres. What happens just before the Planck time at 10-44 seconds? Theorists say that all of the four fundamental forces are presumed to have been unified into one force. All matter, energy, space and time “explode” from the original singularity. 3. Our online “Google” calculator often rounds up the last digit. It is usually beyond the eleventh postion to the right of the decimal point. Could This Be The Smallest-Biggest-Simplest Scientific Experiment? Yes, this journey began by looking inside our clear plastic models of the tetrahedron and octahedron. We wanted to see what was perfectly inside. That was easy. We then asked, “How many steps within would it take to get to the Planck Length?” The Planck Length was a topic in our physics classes. When we found just 50 steps to the diameter of the proton and another 68 steps to the vicinity of the Planck Length, we were surprised. We were expecting many, many more steps. Within a couple of days, we began multiplying each edge by 2. Our goal was to get out into the range of the Observable Universe. It appeared that we were getting into the general vicinity in just 91 steps. What? …so few steps? We were dumbfounded but undeterred. To make our emerging chart of the universe consistent, we decided to start at the Planck Length and just multiply by 2 and assume those simple geometries as a given. But, we weren’t sure we could multiply the Planck Length by 2, so we turned to experts on the Planck Length. One of them said our work was idiosyncratic and would go no further. Another cautioned us to work within group theory but encouraged our work. Frank Wilczek, one of the world’s experts on the Planck Length and an MIT Nobel Laureate, also encouraged our explorations and use of the Planck Length. The Planck Length was first defined in 1899 by Max Planck. Though little used, it is generally accepted to be the smallest meaningful measurement of a length; and because it is based on three constants including the speed of light in a vacuum and the gravitational constant, most scholars believe Planck was right. Though the Observable Universe is a difficult figure to discern, there have been many published guesses over the years. But to give us some confidence that we were on the right track, we turned to a NASA scientist and a French astrophysicist. In this early search, we could not find anybody using base-2 exponential notation to extrapolate a view of the universe. Although our intention was not to create a so-called perfect sequence or scale of lengths from smallest to the largest, we backed into using base-2 exponential notation because it was simple and we were studying embedded-and-nested geometries. So, we could readily number and spatialize each sequence of the scale. It seemed like a logical way to create ordered sets, groups and real relations between everything. Yet, we were quickly approaching our limits of knowledge. Questions abound. What happens in the first 66 notations? Could this be an area for pure math and geometries? Might the first 20 or 30 notations be a domain for cellular automaton? Could the Mind be located somewhere just before the proton? What happens between each doubling? What are the boundary conditions? What is the relation between number and space? Currently we do not know any answers to those questions. Although somebody else might know, we have begun trying to discern a path to discover answers. We began to apply what we knew about the scientific method. How will we identify the types and functions of the constants and variables all along the scale? How will we define the independent and dependent variables? Are there control and moderating variables? What would we use for a control group? Can we begin to make a few hypotheses to test? We are still crawling, trying to find our walking legs. We often find ourselves in a fog of unknowns, but we did come up with a few ideas to create an experiment. Could this be a simple experiment? First, our math gave us somewhere between 202.341 and 205.11 notations,2 or doublings, layers, or steps between the smallest and largest measurements of a length. Our first hypothesis is that there will be significant transitions points along the scale. A most simple projection would be to look for significance within the midpoint (dividing in the entire scale by 2, 1:2). We also hypothesize that there will be something significant at the thirds (dividing the entire scale by 3, 1:3), as well as by fourths, fifths, sixth, sevenths, eights, ninths and tenths. We are currently on that path of discovery. It was easy and straightforward to find a range that we could call the midpoint. It was also easy to discover that these notations are where life begins. Yes, the sperm and egg are within that range. Life appears to be the concrescence of the two extremes. That was a very simple experiment and our hypothesis seems to be validated. It is a significant transition. Next, by dividing by 3, we have begun looking at notations 67 to 69 and 134 to 137. Being relatively inexperienced at understanding such small measurements, we made many initial mistakes. Today, we believe at notation 65 we are close to the size of a proton, (rp = 0.84184(67) fm).3 Here is the basic building block of the visible universe between notation 65 at 5.96272544×10-16 meters and notation 66 at 1.19254509×10-15 meters. Though this scale amounts to a view of the known universe, on a serious note, we will call it a Universe View. On a whimsical note, we call it the Big Board-little universe. It feels unique. We have not seen it within our studies. It gives us perspective. It puts everything in a nice grid. It appears to open new areas to study. Another simple hypothesis emerged. We thought, “People with a universe view would be more optimistic, more insightful, and more productive than people who rely on their own views or even a worldview.” It became a project for the National Science Fair.4 We developed a ten-step tour of this Universe View, then asked people if they felt more optimistic, insightful, and productive as a result. Our results were not conclusive, however, we have not given up on developing a cleaner methodology and a better control group. So what can we might we say and hypothesize about this simple model of the universe? 1. It is a helpful ordering tool. It puts everything in a necessary sequence and a place on a somewhat granular scale. 2. It has inherent geometries. Seen or unseen, we believe these geometries are inherent throughout the known universe and we believe there should be testable hypotheses that we can discern. Perhaps, we are talking about Alfred North Whitehead’s point-free geometries. Our life is filled with things we do not see, but assume there is a structure for it. It could be a memory of times gone by, a creative insight of a possible solution to a problem, or a recurring dream of things to come. 5. A speculative summary. Historically space and time have been the container within which everything takes place. As much as Einstein tried to dislodge Sir Isaac’s commonsense worldview, nothing has really taken its place. We started with simple geometries and mapped the known universe including a very, very small universe that is ignored by most. In our work, number and geometry pervade everything. We can see the Frank Wilczek’s Grid emerging from the Planck Length; there is order and continuity within a deep substructure. As we move up through the notations, we can see and feel relations and symmetries building. Yet, we can also feel and see asymmetries and discontinuities taking shape. Ultimately we just might begin to see more clearly how space becomes derivative of geometry and time derivative of number. We just might be able to move on from Newton’s commonsense and develop a simple-but-compelling universe view, whereby order, relations, and dynamics are known through continuities and discontinuities, symmetries and asymmetries, and harmony and discordance. Everything Starts Most Simply. Therefore, Might It Follow That The Planck Length Becomes The Next Big Thing? Propaedeutics: Analyze three very simple concepts taken from a high school geometry class, (1) the smallest-and-largest measurement of a length, (2) dividing and multiplying by 2, and (3) nested-embedded-and-meshed geometries. Though initially a simple thought exercise (hardly an experiment), our students quickly developed a larger vision to create a working framework to categorize and relate everything in the known universe. Though appearing quite naive and overly ambitious in its scope, the work began at the Planck Length and proceeded to the Observable Universe in somewhere over 202.34+ base-2 exponential notations. That range of notations is examined and the unique place of the first sixty notations is reviewed. This simple mathematical progression and the related geometries, apparently heretofore not examined by the larger academic community, are the praxis; interpreting the meaning of it all is the theoria, and here we posit a very simple foundation to open those discussions. Along this path it seems we will learn how numbers are the function and geometries are the form, how each is the other’s Janus face, and perhaps even how time is derivative of number and space derivative of geometry. Observing how the simplest geometric objects are readily embedded within each other, a high school geometry class1 asked a similar question to that asked by Zeno (circa 430 BC) centuries earlier.2 “How many steps inside can we go before we can go no further?” The students had learned about the Planck Length, a conceptual limit of 1.616199(97)x10-35 meters. Using base-2 exponential notation, these students rather quickly discovered that it took just over 101 steps going within to get into the range of the Planck Length. For this exercise they followed just two geometrical objects, the simple tetrahedron and the octahedron. Within that tetrahedron is an octahedron perfectly enclosed within it. Also, within each corner are four half-sized tetrahedrons. We went inside again. At each notation or step we simply selected an object and divided the edges in half and connected the dots. Perfectly enclosed within the octahedron are six half-sized octahedrons in each of the six corners and eight half-sized tetrahedrons in each of the eight faces. Illustration 2: An octahedron with its simplest internal parts. Four hexagonal plates are outlined, all surrounding the center point. Selecting either a tetrahedron or octahedron, it would seem that one could divide-by-2 or multiply-by-2 each of the edges without limit. If we take the Planck Length as a given, it is not possible at the smallest scale. And, if we take the measurements of the Sloan Digital Sky Survey (SDSS III), Baryon Oscillation Spectroscopic Survey (BOSS)3 as a given, there are also apparent limits within the large-scale universe — it is called the Observable Universe. Also, observe how the total number of tetrahedrons and octahedrons increases at each doubling. At the next doubling there are a total of 10 octahedrons and 24 tetrahedrons. On the third doubling, there are 84 octahedrons and 176 tetrahedrons, and then on the fourth, 680 octahedrons and 1376 tetrahedrons. On the fifth step within, there are 10944 tetrahedrons and 5456 octahedrons. The numbers become astronomically large within 101 steps. It is more aggressive than the base-2 exponential notation used with the classic wheat and chessboard story4 which, of course, is only 64 steps or notations. The following day we followed the simple math going out to the edges of the Observable Universe. There were somewhere between 101 to 105 steps (doublings or notations) to get out in the range of that exceeding large measurement, 1.03885326×1026 meters. By combining these results, we had the entire “known” universe, from the smallest to the largest measurements in 202.34+ (calculation by NASA’s Joe Kolecki) to 205.11+ (calculation by Jean-Pierre Luminet) notations5. At the same time the growth of the number of objects by multiplying or dividing became such a large number that it challenged our imaginations. We had to learn to become comfortable with numbers in new ways — both exceedingly large and exceedingly small, and the huge numbers of objects. Not long into this exploration it was realized that to achieve a consistent framework for measurements, this simple model for our universe ought to begin with the Planck Length (ℓP). It was a very straightforward project to multiply by 2 from the ℓP to the edges of the Observable Universe (OU). That model first became a rather long chart that was dubbed the Big Board – little universe.6 And then, sometime later we began converting it to a much smaller table7 (also, a working draft). 1. Planck Length. Why is the Planck Length the right place to start? Can it be multiplied by 2? What happens at each step? 3. Embedded Geometries. When we start at the human scale to go smaller by dividing by 2, the number of tetrahedrons and octahedrons at each notation are multiplied by 4 and 1 within the tetrahedron and by 8 and 6 within the octahedron. That results in an astronomical volume of tetrahedrons and octahedrons as we approach the size of a proton. What does it mean and what can we do with that information? Starting at the Planck Length, a possible tetrahedron can manifest at the second doubling and an octahedron could manifest at the third doubling. Thereafter, growth is exponential, base-4 and base-1 within the tetrahedron and base-8 and base-6 within the octahedron. To begin to understand what these numbers, the simple math, and the geometry could possibly mean, we turned to the history of scholarship particularly focusing on the Planck Length. Discussions about the meaning of the Planck Length. Physics Today (Mead – Wilczek discussions).9 Though formulated in 1899 and 1900, the Planck Length received very little attention until C. Alden Mead in 1959 submitted a paper proposing that the Planck Length and Planck Time should “…play a more fundamental role in physics.” Though published in Physical Review in 1964, very little positive feedback was forthcoming. Frank Wilczek in that 2001 Physics Today article comments that “…C. Alden Mead’s discussion is the earliest that I am aware of.” He posited the Planck constants as real realities within experimental constructs whereby these constants became more than mathematical curiosities. Frank Wilczek continued his analysis in several papers and books and he has personally encouraged the students and me to continue to focus on the Planck Length. We are. Our class was basic science and mathematics, focusing on geometry. My assignment was to introduce the students to the five platonic solids. Yet, by our third time together, we were engaging the Planck Length. Is it a single point? Is it a vertex making the simplest space? What else could it be? Can it be more than just a physical measurement? Are we looking at point-free geometry?10 Is this a pre-structure for group theory?11 Speculations quickly got out of hand. We knew we would be coming back to those questions over and over again, so we went on. We had to assume that the measurement could be multiplied by 2. We attributed that doubling to the thrust of life.12 So, now we have two points, or two vertices, or a line, and a larger space of some kind. Prof. Dr. Freeman Dyson13 in a personal email suggests, “Since space has three dimensions, the number of points goes up by a factor eight, not two, when you double the scale.” We liked that idea; it would give us more breathing room. However, when we realized there would be an abundance of vertices, we decided to continue to multiply by two. We wanted to establish a simple platform using base-2 exponential notation especially because it seemed to mimic life’s cellular division and chemical bonding. Within the first ten doublings, there are over 1000 vertices. Perhaps we might think about Plato’s Eidos, the Forms. Within twenty doublings, there are over a million vertices. What about Aristotle’s Ousia or Categories? Within thirty steps, there are over a billion vertices. Perhaps we could hypostatize Substances, a fundamental layer that anticipates the table of elements or periodic table. Within forty layers, there are over a trillion vertices. Might we intuit Qualities? Within 50 doublings, there over a quadrillion vertices. How about layers for Primary Relations, the precursors of subjects and objects? Between the 50th and 60th notation, still much smaller than the proton, there are over a quintillion vertices. Perhaps Systems and The Mind, and every possible manifestation of a mind, awaits its place within this ever-growing matrix or grid. The simple mathematics for these notations, virtually the entire small-scale universe, appears to be the domain of elementary cellular automata going back to the 1940s work of John von Neumann, Nicholas Metropolis and Stanislaw Ulam, and the more recent work of John Conway and his Game of Life, and most recently the work of Stephen Wolfram and his research behind A New Kind of Science. With so many vertices, one could build a diversity of constructions, then ask the question, “What does it mean?” Our exercise with the simplest math and simple concepts is the praxis. We have begun to turn to the history of scholarship to begin to deem the theoria and begin to see if any of our intuitions might somehow fit. We knew our efforts were naive, surely a bit idiosyncratic (as physicist, John Baez14 had characterized them), but we were attempting to create a path that would take us from the simplest to the most complex. If we stayed with our simple math and simple geometries, we figured that we did not have to understand the dynamics of protons, fermions, scalar constraints and modes, gravitational fields, and so so much more. That could come later. Although not studied per se, these 60 notations have been characterized throughout the years. Within the scientific age, it has been discussed as the luminiferous aether (ether).15 Published in 1887 by Michelson–Morley, their work put this theory to rest for about a century. Yet, over the years, the theories around an aether have been often revisited. The ancient Greek philosophers called it quintessence15 and that term has been adopted by today’s theorists for a form of dark energy. Oxford physicist-philosopher Roger Penrose16 calls it, Conformal Cyclic Cosmology made popular within his book, Cycles of Time. Frank Wilczek simply calls this domain, the Grid,17 and the most complete review of it is within his book, The Lightness of Being. We know with just two years of work on this so-called Big Board – little universe chart and much less time on our compact table, we will be exploring those 60-to-65 initial steps most closely for years to come. This project will be in an early-stage development for a lifetime. This construction with its simple nested geometries and simple calculations (multiplying the Planck Length by 2 as few as 202.34 times to as many as 205.11 times) puts the entire universe in an mathematically ordered set and a geometrically homogeneous group. Although functionally interesting, quite simple and rather novel, is it useful? Some of the students thought it was. This author thought it was. And, a few scholars with whom we have spoken encouraged us. So the issue now is to continue to build on it until it has some real practical philosophical, mathematical, and scientific applicability. 1. Parameters. These parameters have functions; each creates a simple order and that order creates continuity. The form is order and the function is “to create continuity or its antithesis, discontinuity.” As a side note, one could observe, that this simple parameter set is also the beginning of memory and intelligence. 3. Dynamics. Our simple parameters, now manifesting real relations that have the potential to be extended in time, create a foundation for dynamics, all dynamics. That is the form with the potential to become a category, and the function is to create various harmonies or to create disproportion, imbalance, or disagreement. Dynamics open us to explore such concepts as periodicity, waves, cycles, frequency, fluctuations, and more. And, this third parameter set, dynamics-harmony, necessarily introduces our perception of time. With this additional parameter set we begin to intuit what might give rise to the fullness of any moment in time and of time itself. Also, perspectivally, these parameter sets, on one side, just might could summarize perfection or a perfected moment in time, and on the other side, imperfection or quantum physics. Please note that our use of the double modal, might could, is a projection for future, intense analysis and interpretation. It is a common expression in the New Orleans area. The first imperfection can occur very early within the notations (doublings-steps-vertices). With the first doubling there are two vertices (the smallest line or smallest-possible string). At the next doubling, there are four vertices; a perfect tetrahedron could be rendered. It is the simplest three-dimensional form defined by the fewest number of vertices and equal angles. There are other logical possibilities: (1) four vertices form a longer line or string, (2) four vertices form a jagged line or string of which various skewed triangles and polygons could be formed, (3) three vertices form a triangle that defines a plane with the fourth vertex forming an imperfect tetrahedron that opens the first three dimensions of space. Five vertices can be used to create two tetrahedrons with a common face. Six vertices could be used to create an octahedron or three abutting tetrahedrons (two faces are shared). The third doubling renders eight vertices. With just seven of those vertices, a pentagonal cluster of five tetrahedrons can be inscribed (Illustration 3), however, there is a gap of about 7.36° (7° 21′) or less than 1.5° between each face.19 There are many other configurations of a five-tetrahedral construction that can be created with those seven vertices. These will be addressed in a separate article. For our discussions here, it seems that each suggests a necessarily imperfect construction. The parts only fit together by stretching them out of their simple perfection. One might speculate that the spaces created within these imperfections could also provide room for movement or fluctuation. Illustration 3: The earliest analysis of these five regular tetrahedra sharing one edge appears to be the work of F. C. Frank and J.S. Kaspers in their 1959 analysis of complex alloy structures. (See footnote 19 for more details on this reference). With all eight vertices, a rather simple-but-complex figure can be readily constructed with six tetrahedrons, three on either side of a rather-stretched pyramid filling an empty space between each group. This figure has many different manifestations using just eight vertices. Between seven and eight vertices is a key step in this simple evolution. Both figures can morph and change in many different ways, breaking-and-making perfect constructions. In one’s most speculative, intuitive moments, one “might-could” see these constructions as a way of engaging the current work with the Lie Group,20 yet here may begin a different approach to continuous transformations groups. Just by replicating these eight vertices, a tetrahedral-octahedral-tetrahedral (TOT) chain emerges. Here two octahedrons and two tetrahedrons are perfectly aligned by the eight and a simple structure reaching from the smallest to the largest readily emerges and tiles the universe. Then, there is yet another very special hexagonal tiling application to be studied within the octahedron by observing how each of the four hexagonal plates interact with all congruent tetrahedrons. Within the all the following notations simplicity begets complexity. Structures become diverse. And, grids of potential and a matrix of possibilities are unlocked. 1 Monday, December 19, 2011 Bruce Camber substituted for the geometry teacher within the John Curtis Christian High School, just up river from New Orleans. The concept of a Big Board – little universe developed within the context of these classes. 3 For most students, the wheat & chessboard example is their introduction to exponential notation. Wikipedia provides an overview. 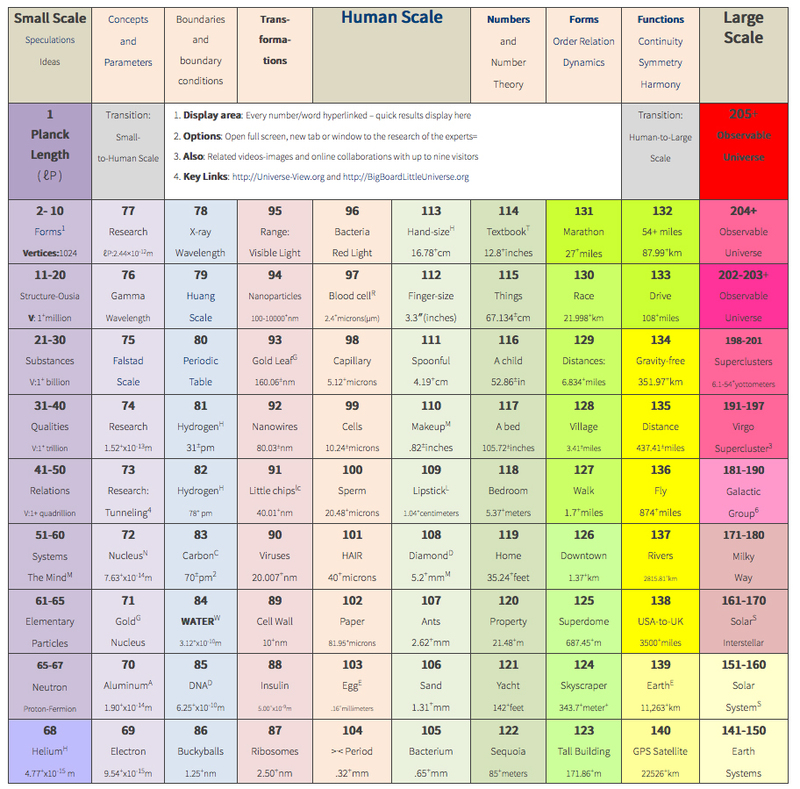 6 Big Board – little universe, a five foot by one foot chart that begins with the Planck Length and uses exponential notation to go to the width of a human hair in 102 steps and to the edges of the observable universe in 202.34-to-205.11 notations, or steps, or doublings. 7 Universe Table, ten columns by eleven rows, this table is made to be displayed on Smartphones and every other form of a computer. At the time of this writing, Version 1.0.0.2. was posted..
9Frank Wilczek, the head of the Center for Theoretical Physics at MIT and a 2004 Nobel Laureate has a series of articles about the Planck Length within Physics Today. Called Scaling Mt. Planck, these are all well-worth the read. His book, The Lightness of Being, to date, is his most comprehensive summary. 10 Point-free geometry, a concept introduced by A. N. Whitehead in 1919/1920, was further refined in 1929 within his publication of the book, Process & Reality. More recent studies within mereotopology continue to extend Whitehead’s initial work. 11 One might speculate that group theory, with its related subjects such as combinatorics, fields, representation theory, system theory and Lie transformation groups, all apply in some way to the transformation from one notation to the next. Yet, two transformations seem to beg for special attention. One is from the Human Scale to the Small Scale and the other from the Human Scale to the Large Scale. If there are 202.34-to-205.11 notations, our focus might turn to steps 67 to 69 at the small scale and 134 to 138 at the large scale universe. One’s speculations might could run ahead of one’s imaginative sensibilities. For example, at the transformation to the small scale, approximately in the range of the diameter of a proton, one could hypostatize that this is where the number of embedded geometries begins to contract to begin to approach the most-simple structure of the Planck Length. It would follow that within the small-scale all structures would necessarily be shared. Perhaps the proton is some kind of a boundary for individuation. That is, the closer one gets to the singularity of the Planck Length, the more those basic geometric structures within the notation are shared. Because this structure currently appears to be beyond the scope of measuring devices, we could refer to these notations as a hypostatic science, whereby hypotheses, though apparently impossible to test, are still not beyond the scope of imagination. Also, as the large scale is approached, somewhere between notations 134 to 138, there might be a concrescence that opens the way to even more speculative thinking. Though not very large — between 248 miles (notation 134) and- 3500 miles (notation 138) — it might appear to be silly, truly nonsensical, to begin the search for the Einstein-Rosen bridges or wormholes! That’s certainly science fiction. Yet, if we let an idea simmer for awhile, maybe workable insights might-could begin to emerge. 12 Although the term, Thrust of Life, is used within religious and philosophical studies, it is also the subject of continuous scientific study by groups such as the Center for Science for of Information (Purdue University) through funding from the National Science Foundation. 13 Personal email to me regarding multiplying the Planck Length by 2, he said: “Since space has three dimensions, the number of points goes up by a factor eight, not two, when you double the scale.” Certainly a cogent comment, however, given we have seemingly more than enough vertices, we decided on the first pass to continue to multiply by 2 to create an initial framework from which attempt to grasp what was important and functional. 15 The luminiferous aether was posited by many of the leading scientists of the 18th century, Sir Issac Newton (Optiks) being the most luminous. The Michael-Morley experiments of 1887 put the theory on hold such that the theory of relativity and quantum theory emerged. Yet, research to understand this abiding concept has not stopped. And, it appears that the editorial groups within Wikipedia are committed to updating that research. 16 Quintessence, the Fifth Element in Plato’s Timaeus, has been used interchangeably with the aether aether. It has a long philosophical history. That the word has been adopted in today’s discussion as one of the forms of dark energy tells us how important these physicists believe dark energy is. 17 Roger Penrose inspired the 1998 book, The Geometric Universe: Science, Geometry, and the Work of Roger Penrose. Surely Penrose is one of the world’s leading thinkers in mathematics and physics. He has been in the forefront of current research and theory since 1967, however, his work on Conformal Cyclic Cosmology is not based on simple mathematics or simple geometries. It is based on the historic and ongoing tensions within his disciplines. Though his book, Cycles of Time, written for the general population, it is brings all that history and tension with it. 18 Frank Wilczek has written extensively about the Planck length. He recognizes its signature importance within physics. When we approached him with our naive questions via email in December 2012, we did not expect an answer, but, we received one. It was tight, to the point, and challenged us to be more clear. Given he was such a world-renown expert on such matters, we were overjoyed to respond. The entire dialogue will go online at some time. He is a gracious, thoughtful thinker who does not suffer fools gladly. And because we believe, like he does, in beauty and simplicity, perhaps there will be a future dialogue that will further embolden us. 20 The work of Sophus Lie (1842 – 1899), a Norwegian mathematician, not only opened the way to the theory of continuous transformation groups for all of mathematics, it has given us a pivot point within group theory by which to move our analysis from parameters to boundary conditions and on to transformations between each notation. We are hoping that we are diligent enough to become Sophus Lie scholars. In 1970 Bruce Camber began his initial studies of the 1935 Einstein-Podolsky-Rosen (EPR) thought experiment. In 1972 he was recruited by the Boston University School of Theology based on (1) his research of perfected states in space-time through work within a think tank in Cambridge, Massachusetts, (2) his work within the Boston University Department of Physics, Boston Colloquium for the Philosophy of Science, and (3) his work with Arthur Loeb (Harvard) and the Philomorphs. With introductions by Victor Weisskopf (MIT) and Lew Kowarski (BU), he went to CERN on two occasions, primarily to discuss the EPR paradox with John Bell. In 1979, he coordinated a project at MIT with the World Council of Churches to explore shared first principles between the major academic disciplines represented by 77 peer-selected, leading-living scholars. In 1980 he spent a semester with Olivier Costa de Beauregard and Jean-Pierre Vigier at the Institut Henri Poincaré focusing on the EPR tests of Alain Aspect at the Orsay-based Institut d’Optique. In 1994, following the death of another mentor, David Bohm, Camber re-engaged simple interior geometries based on several discussions with Bohm and his book, Fragmentation & Wholeness. In 1997 he made the simple models of the tetrahedron and octahedron that are used just above. In 2002, he spent a day with John Conway at Princeton to discuss the simplicity of the interior parts of the tetrahedron and octahedron. In 2011, he challenged a high school geometry class to use base-2 exponential notation to follow the interior structure of basic geometries from the Planck Length and to the edges of the Observable Universe. There are many numbers in between the two. Each “0” represents a major base-10 transformation; and within each base-10, there are three or four base-2 notations. Though some say that the Planck Length is a special type of singularity, it has a specific length. Yet, that length is so small, for about 100 years, it was virtually ignored by the entire scientific community. Perhaps a better way of looking at the Planck Length is through the lenses of geometry. If we make it one of Alfred North Whitehead’s point-free vertices of a specific length, each time we multiply by two we grow the size as well as the number of vertices. The Numbers of Vertices at Key Notations Between 1 and 65. When you assume that the Planck Length is a vertex, unusual concepts flow. First, consider the generation of vertices just by multiplying by 2, then each result by two, over and over again. By the tenth doubling there are 1024 vertices. By the 20th doubling, over a million more are added. On the 30th, another billion+ are added. Then, comes another trillion+ at the 40th, a quadrillion+ at the 50th notation and a quintillion+ at the 60th. At the 61st there are another 2+ quintillion vertices added. These vast arrays and systems of vertices cannot be observed. This is the domain of postulations and hypostatizations. Consider this concept: going within from about the 65th notation, the domains begin to be shared. More and more is shared by everything as the Planck Length approaches. Each notation organizes uniquely, yet within groups. And these natural groupings reflect all the diversity within all the notations 65 and higher. It seems that the mathematics of cellular automaton may figure into the first 20 or 30 notations. We start with the most basic Forms, then Structures, which become the pre-structure for Substances, archetypes for Qualities, then Relations, then the Mind. We turn to systems theory, group theory, and set theory to discern the order of things. * Notations 50-60 and the foundations of the Mind, logic, psychology, memory, thought, epistemology and learning with over 500 trillion vertices at the 59th notation and then another quintillion+ vertices within the 60th notation. * Notations 135-138, the transition to the Large-Scale Universe with the possibilities of uncovering pathways to the Einstein-Rosen bridges and tunnels also known as wormholes. Facts & Guesses. The Facts are what is measurable and what fits within each domain. The Guesses are about what goes on with those domains (aka steps, notations, layers or doublings) especially those that remain blank. Is there a pattern, especially a cyclic pattern that manifests in another notation? We followed Max Planck where he took the constants of nature, starting with the speed of light to calculate the smallest number. We took the age of the universe, with some help from scientists, to learn the largest calculation of a length, the Observable Universe. Making sense of these numbers is another story. So, over the forthcoming weeks, months and years, we will be looking even deeper. Would you help us now and take the little survey? Notes about Look-and-feel and Navigation: If a little thumbnail of any picture is displayed, simply refresh your browser and the full-size version hopefully will paste in. Also, if any of the letters from right column, particularly the Archives and Meta listings, are bleeding through the image of the Universe Table, please open your window larger (possibly to full screen). Usually if you click on the last sentence in each description you will go to the next page. 1Three downloads authored by Prof. Dr. Frank Wilczek: Scaling Mt. Planck (from Columbia University), C. Alden Mead’s letter and Wilczek’s response in Physics Today, and Wilczek’s August 2013 Lecture notes on units and magnitude (If you like this paper, also read this one). An article (unpublished) to attempt to analyze this simple model. There are pictures of a tetrahedron and octahedron. A background story: It started in a high school geometry class on December 19, 2011. The sequel: Almost two years later, a student stimulates the creation of this little tour. Thank you. Survey #2 is much like the first survey, short and sweet. Yet, we must remind you that you’ll be anonymous in this project. You are also free to decide not to answer any question or stop the survey at any time. Also, there will be no personal identifiers, such as your email, and any and all personal information will be removed from this data prior to use. Please use an impersonal identifier to help us match up this survey with your next survey. Your participation will help me with my research. We will be asking about your views in response to a tour of the Universe based on our Big Board for our little Universe that we began developing in my sophomore year. This is a very simple survey. Nevertheless, there is always a possibility of tampering from an outside source when using the internet for collecting information. While the confidentiality of your responses will be protected once the data is downloaded from the internet, there is always a possibility of hacking or other security breaches that could threaten the confidentiality of your responses. By clicking here you will go to the survey and you are acknowledging that you have read and understood these guidelines and consent. Welcome back. Hopefully you have had a week to think about the first tour. We’ll review it, then we’ll go further in depth. This information is a new frame of reference. It gives us the simplest possible model of the known universe in an ordered relation. It has surprised many. This is a new tool to engage the universe and to envision the unexplored. Base-2 exponential notation is just a fancy way of saying, multiply by 2. You learned how to do that very well throughout elementary school. Yet, for the first time you are applying it to everything in the universe from the smallest to the largest measurements of a length. Nobody expected to find just 202.34 to 205.11 notations, or doublings, layers or steps. People stopped right there. They just couldn’t believe it. “Then, there is something wrong with your logic.” Yet, the math is the math and it does compute. The logic is the simple logic and it also computes. Let us explore a bit more deeply. There are many, many unknowns. You will find mostly guesses from notations 1 to 65. There are many other blanks in the 70s and from 170 to 202. The goal is to have an entry for every notation because each notation builds on the prior notation. Perhaps with some reflections we might emerge with rational explanations to understand the relations and dynamics of each and between each. Notes about Look-and-Feel and Navigation: Links from the headers below the line go to the Index page. If any of the letters from right column, particularly the words, Archives and Meta, are bleeding through the image of the Universe Table, please open your window larger (possibly to full screen). If the header for this page is in more than two lines, you also need to open your window a little larger. If you came back here after completing the survey, please click on the pink arrow on the right to go on the tour of the Big Board-little universe. Footnotes: On every page there are references and more notes about the how these charts came to be. An article (unpublished) to attempt to analyze this simple model that seems to suggest that time is derivative of numbers and space is derivative of geometries. There are pictures of a tetrahedron and octahedron. This project began when we looked inside a tetrahedron and octahedron (two of the most basic geometric figures).1 Think of the embedded Russian (matryoshka) dolls. Usually there are no more than ten. Yet, here inside each tetrahedron there are four half-size tetrahedrons and an octahedron. Inside the octahedron are six half-sized octahedrons and eight tetrahedrons all sharing a common centerpoint and many common edges. It would seem that one could just kept going forever. Yet eventually you will reach the Planck length and can go no further. To standardize our study, we started at the Planck Length and multiplied it by 2 until we were at the Observable Universe. We were surprised to discover only 202-to-206 notations (or steps or layers or doublings) to go from the smallest to the largest measurements of a length.